Ubisoft on Assassin's Creed Unity: 30fps "Feels More Cinematic"
Whether the company enjoys the press or not, there's been a lot said in the last few weeks about Assassin's Creed Unity, console parity and the resolution and framerate of the game. 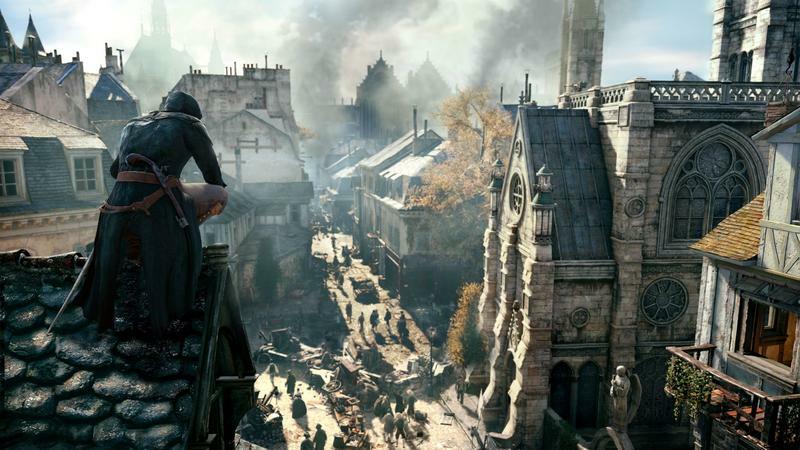 In case you missed it, Assassin's Creed Unity will run at 30fps in 900p on both the PlayStation 4 and Xbox One. One developer from Ubisoft went on record saying that the company decided to lock the game to the same specs on both platforms in order to "avoid all the debates and stuff," though that has since been denied. Now, more developers from Ubisoft have gone on the record with TechRadar regarding the framerate and resolution of Assassin's Creed Unity and future Ubisoft titles. What they had to say, I imagine, will rub some gamers the wrong way. We'll start with Alex Amancio, Creative Directer on Unity. "30 was our goal, it feels more cinematic. 60 is really good for a shooter, action adventure not so much. It actually feels better for people when it's at that 30fps. It also lets us push the limits of everything to the maximum. It's like when people start asking about resolution. Is it the number of the quality of [sic] the pixels that you want? If the game looks gorgeous, who cares about the number?" I can get behind the latter portion of his argument. I absolutely fall into the camp of folks who doesn't care about numbers as long as the experience is smooth and pretty. As for 30fps feeling more cinematic than 60? I'll never understand that. First of all, the old standard framerate for film is 24fps, not 30. Those frames came with flickers of black from the closure of the projector's shutter, too. With the push to digital, that's evaporating and films are being shot in all sorts of framerates. Ubisoft, from where I'm sitting, isn't making Assassin's Creed Unity in 30fps because it "looks more cinematic," they're doing it because the consoles can't maintain the game's engine at 60fps. Nicolas Guérin, World Level Design Director on Unity, used the same "cinematic" argument, but he drove home the point that it's much harder to reach 60fps than 30. That bit I completely believe. "At Ubisoft for a long time we wanted to push 60 fps. I don't think it was a good idea because you don't gain that much from 60 fps and it doesn't look like the real thing. It's a bit like The Hobbit movie, it looked really weird. And in other games it's the same – like the Rachet and Clank series [where it was dropped]. So I think collectively in the video game industry we're dropping that standard because it's hard to achieve, it's twice as hard as 30fps, and its not really that great in terms of rendering quality of the picture and the image." Where do you stand on the resolution and framerate debate? Does it enter into your mind when considering consoles and games?